The first time I ever heard about CrossFit, as it is usual the case, was through a friend. Out of nowhere my friend Lydia, who I would sum up as sweet, trendy girl with an impeccable taste in fashion, suddenly posted pics of herself on Facebook doing barbell squats, pull ups and 1-handed handstands. When we met in Munich ten years ago I would have never thought her to be the athletic type, but there she was strong and power cleaning barbells which could easily make a pack of sledge dogs go on strike. But then she always was good at having her finger on the pulse of time. And by that time CrossFit already went viral in the US and was taking hold in Europe and Asia. In a nutshell CrossFit describes itself as a no-nonsense high intensity gym program focusing on functional movements based on power- and olympic weight lifting, plyometrics, circuit- and speed training and even gymnastics. In short: One hell of a a workout. And the sport which is mostly associated with the Paleo lifestyle according to the knowledge authority of Google is, you guessed right, CrossFit. So I knew that at some point I would have to personally come in touch with CrossFit and see what it's all about. Therefore it almost felt like a predetermined course of events when I virtually bumped into CrossFit Coach Alix James while discussing creatine use and weight lifting programs in a Hong Kong Expat forum. He offered me to drop by his gym CrossFit Asphodel in Quarry Bay where he could show me the proper basic power-lifting techniques. 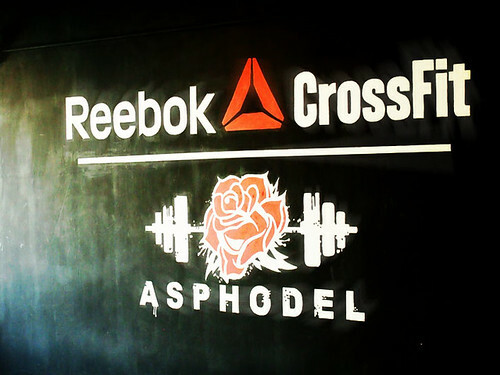 With Asphodel being the only official CrossFit affiliate in Hong Kong, I immediately jumped at the opportunity and asked if he could also spare some time to talk about CrossFit and nutrition as well. If you are given an inch, go for an ell, I say. It's a hot Hong Kong summer's day when I take the MTR to Tai Koo not really knowing what to expect. Well, I have seen the CrossFit videos on YouTube and it's hard not to feel a bit awed by jacked people doing handstand push-ups and flipping truck tires across a parking lot. CrossFit gyms are often a bit more gritty than your usual premier health and fitness studio. Therefore it was almost a given to find CrossFit Asphodel in an industrial building. The gym is a well rounded mix of 60% fight club workout venue, 20% garage and 20% adventure playground. I brace myself for Tyler Durden to somersault into my field of vision. Instead I am enthusiastically greeted by Asphodel's mascot pooch Smokey. Alix shows up right away, and he looks like how I imagine a full fledged CrossFit coach to be: short hair, bearded (no idea why my mind insists on a beard) and built like a character from a street fighter video game. I would have not been the least surprised if he had the ability to create glowing energy balls between the palm of his hands. Turned out the thought is not so far off. Alix came to Hong Kong from the UK four years ago to work as a boxing trainer and was still actively boxing and doing muay thai. Through people in the boxing gym he got into CrossFit. A few years later he partnered up with Ashley Booth, and they both opened CrossFit Asphodel in Quarry Bay. While Alix is showing me warm-up exercises before we get to the lifts, Ashley is busy spotting a client's clean and jerk technique. Alix must have sensed that I am a bit intimidated and therefore focuses more on getting the proper technique across rather than getting me to lift with heavy weights right away. We start with practising with PVC pipes, progress to lifting a metal bar and then later adding weights. Although powerlifting moves look straight forward and simple, there are quite a few factors like posture, arm positioning and the movement itself one has to pay attention to. Whenever Alix corrects me, he explains the reason in a way that it sticks and does not make me feel like an absolute muppet. Slowly more and more people trickle in for the next class and I get a chance to observe a proper CrossFit session. Today is a jump day so they start with mobility work focusing on tight areas of their legs, followed by a 15 minute workout which would include box jumps, squats and also core assistance exercices such as pull-ups. Seems to me timed high reps and short recovery is the order of the day. Alix estimates that 60% of their clients are male and 40% are female. Most of them are professionals in their late twenties to early thirties, showing up three to five times a week. Coming from the New Territories I wonder if their clients only consist of people living on Hong Kong Island. Alix admits that Quarry Bay is a bit further away but tells me of a client from Shatin coming in up to four times a week. "What we normally find is that when people actually come in and they start training, they start realizing maybe it's worth it. I mean it's an hour of a day which is not work and it's fun." Music is cranked up louder and we watch the class putting in some work and clearly having fun. Suddenly there is clapping and whooping. One of the guys just managed to jump on a 50 inch (1.27 m) high box. What does it take for a CrossFit Newbie? Aside from the willingness to come out to Quarry Bay the most important thing for people who want to start doing CrossFit is having a good mind set: "They want to get better, they want to progress and they want to get stronger. Every member gets a notebook where they can track their progress. We also record the best times on a white board for people to have bench marks." That is probably what makes CrossFit so attractive. People push themselves, and start going for a potential they previously did not think was possible before, and are therefore willing to put in the effort and the training. But before CrossFit newbies can take off, they will have to go through an introduction program called On Ramp consisting of two 2 hour sessions. In those sessions people will be assessed, and are taught the basic movements and lifts. Once they have that dialled in they can partcipate in the regular classes and give it their all. During On Ramp people will also be educated on recommended nutritonal plans. "It's a Paleo method. Slightly more modified to CrossFit. We give them a rough template. What I found worked best is just to pick from big food groups. Pick one meat, one vegetable, one condiment and that's your meal. I found that much better than telling someone that on Thursday you will have chicken with lemon. But then for some reason you can't get any chicken or lemon on that day, so you go and have McDonalds. That will only give people a reason to fall of the wagon. Often people come in here and want something more specific and we do 30 day challenges where they get more guidance but I won't give anyone a meal plan." I spot a card board hanging in the gym which lists a few nutrition guidelines. It urges people to stick to natural foods. The coaches share the sentiment that the more something has been changed or processed, the less likely it's going to be good for you. Meats, vegetables are considered essentially unchanged. So that's what people should go for. Carbohydrates should be kept low and have their place pre- or post-workout. With the template approach, Alix emphasizes, people can tweak their diet according to their needs and goals. People differ from each other and so does the way they eat. With an abashed grin Alix admits that he is having cheat meals and speaks of cheese cake as if it was a caloric supplement. Other people though might have to follow a stricter approach if their goal is to lean out, or are just like me genetically not that lucky and already suffer from an insulin spike when thinking about words which rhyme with sugar. "Sometimes people here hit a plateau. Then they ask around and compare themselves with other people. "People who show the best performance are the people who sleep the best and who eat the best."